Do you think this will have a positive or negative impact on Fox DVD releases? What is Disney’s track record for releasing DVD content? I wonder if they would be more likely to finish DVD sets like “The Fall Guy” or less likely. Disney barely releases their own new material on DVD anymore, and their acquisition of Fox was in part to beef up their upcoming streaming service. Right now it is having a negative effect on Fox theatrical releases, especially four low-budget pictures shot under the Fox banner that are in limbo until Disney decides what to do with them. Budding careers are on indefinite hold and it breaks my heart. Shout Factory is best to pick up all or most of Fox's TV library. But will Disney license stuff out? Well, they have in the past. They licensed a few dvds to (I think), Anchor Bay. But that was a long long time ago. I'm sure they're more concerned with their streaming service at the moment. Streaming service and getting back some of the Marvel (Wolverine and X-Men, Fantastic Four) and LucasFIlm content. Fox & Disney – the absolutely two worst studios for releasing classic/catalog TV and movies properly, if at all, on physical media. Disney does the occasional "classic" TV release but it's usually "limited" so get it while you can. They think the "Vault" method of distributing many movies is a good thing and treat Walt era live-action movies as also-rans, typically with poor transfers. Fox treats most catalog product poorly and often does slip-shod releases. Either 4:3 copies of WS movies or defective pressings of TV seasons (that they refuse to acknowledge). Both were among the last studios to realize they needed to release WS product properly formatted in OAR on *DVD*. Disney actually called their P&S releases of WS movies "Family friendly." It was Blu-ray that finally got some titles from both studios rereleased in their OAR. Even then both studios have ignored titles fans would love to see receive a proper remaster and release on BR. They both seem to be focusing their attention on TV shows and movies from the past ~20 years. Combined = not good for physical media, especially so with Disney launching their own streaming service. I think the real question is what Fox TV on DVD releases. They almost never release a classic TV release and after they got tired of Buffy and Angel after the 5th re-release they don't really release anything. Yeah like 1998-2001 so they really don't do that now. Exactly. Since Fox got down to almost no releases, Disney can basically only release more. They won't release more but it's not like they can really release less. Disney licensed some of the Touchstone library to Kino a couple years ago. I'm afraid that it will have a negative impact on releasing "classic" titles. I was really hoping that the "Anna and the King" tv series would make it out on DVD. Less chance of it now. Could Disney buy Batman from WB now, seeing as they now own 50% of the classic series. Well, anything could happen. I mean, Disney bought Fox. But almost certainly no. The '66 series means very little in the grand scheme of things and Batman is worth far, far more than that. And that's assuming AT&T would ever even be in the mood to sell. Plus, they probably already did whatever haggling was necessary to get the series released on Blu and usable by WBDC for licensing, so that would be a non-factor going forward. And that's assuming AT&T would ever even be in the mood to sell. AT&T owns Batman? When did that take place? When they bought Warner Brothers. Everybody is eating everyone up these days it seems. It appears Fox's home entertainment stuff (ie. dvds, blurays, etc …) will now be handled by the Disney home video division. Fox's long time home enertainment head Mke Dunn was canned earlier today. My guess is this the "first shot across the bow" in dismantling and shutting down Fox's home entertainment division. Especially with the former Fox home enertainment division head being canned today. Most likely any former Fox employees being transferred over to Disney's home entertainment division (ie. dvds, blurays, etc …), will not be anybody who is in any position to call the shots. This why I was against this deal, Disney now has two libraries that will rot along side with their own. Most likely what will happen is Disney will look through Fox's TV library and deem what they consider a cash cow and leave the rest to rot. They really want their streaming platform to succeed. They will likely shove anything they can onto that. Hell, they might even fix some stuff Fox never would, like new Newhart masters, or finding Lou Grant S5. I mean, look at what Fox finally let escape from the vault in the months leading up to Disney taking over… St. Elsewhere, The Practice, Dharma and Greg, a lot of stuff that never made it to disc entirely. Disney will probably go further to make their platform seem bigger. Now, as for disc releases? Don't count on it. Shout released both Newhart and Lou Grant, I don't remember hearing complaints about the picture quality on those titles. Physical releases is why I am still against the deal, that's why I said about the libraries rotting away. Well, if you don't care for streaming, I'm afraid you're going to be mighty disappointed with the future. The companies have successfully put the genie back in the bottle by clawing the concept of ownership back from the people and convincing them that a glorified rental scheme is the way to go. And it's likely only going to get worse. However, the libraries won't be rotting away. They'll be available… to rent, not to own. If you insist on owning something, that probably won't happen. Lets hope VEI still has a contact at Disney who has the authority to make outsourcing/licensing decisions for tv shows owned by Disney/ABC/BuenaVista. VEI released a few Disney/ABC owned shows: Grandfathered, Galavant, The Whispers. I still have the actual physical DVD's Blu-ray's and even VHS's so I'm good, especially when those streaming sites go down for any various numbered reasons. Oh yes, as I can easily see Disney renting out it's library. They most likely don't even know what they have as the last time anyone visited the vaults was maybe back in very early 2010-2011. While I (reluctantly) agree that eventually streaming will be the new norm, Disney really will need to be careful or they could shout themselves in the foot (so to speak). I am against the deal for a variety of reasons. People have been predicting the immediate demise of DVDs/blu rays for at least 4-5 years now and while streaming grows physical media is decreasing but physical media still remains. It is not gone just yet and it will not be gone next year either. There are still people (non collectors) who do rely on physical media. They either don’t have reliable internet that can handle streaming (yes, the whole US is not fully accessible for streaming) or other factors (outside their control) prevent them from utilizing streaming services. While I have no doubt that Disney has been foolish at times in the past (and could also be in the future) I don’t think that they will want to lose money and customers who don’t stream just yet. I also wanted to add something about unreleased shows (mainly because I don’t think it is said enough in the forum). I also have mixed feelings about the shows that haven’t been released. Like everyone else I have shows I want to see released and haven’t and it saddens me they probably never will be. Regardless of my feelings about the merger I want to point out that I don’t think it will really change the chances of anything getting released. As some have said fox really wasn’t releasing much anyway and Disney will probably follow suit. I don’t really see any true scenario where fox would be purchased and all the library released. My personal thoughts on the tv on dvd release slowdown is that most easy to release, popular, money making shows have been released and now what remains are mainly shows that don’t have as wide a fan base, have rights issues, are too topical, etc, are what is left. Those factors don’t really change too much when studios are bought and sold (it could help rights issues maybe or expand possibilities of outsourcing at times, but that also opens up another can of worms about quality complaints). All in all, I agree that the Disney/fox merger is bad news and probably won’t help the physical media community, but I also don’t think it changes a lot in the long run. The libraries still exist with the same titles still being unreleased. Streaming is still overtaking physical media (although it is not completely overtaken yet). Now unfortunately we have one less studio and a huge loss for the entertainment industry as a whole. Not that I'm clairvoyant but I think companies will still sell downloads over going rental/streaming-only. Why not? It's another way to make money from people who won't pay for multiple streaming services. But not TV shows and only lesser touchstone movies no classic or big Disney titles. What about reviving the recordable DVD market for those who want physical media? I still have two of these, and some are still sold but hard to find. I am now recording my favorite series to be a back up in case a season is not released. Of course it is not a perfect solution, but rather easy if you still have cable. When “The Walking Dead”, “The Orville”, “Fear The Walking Dead” and “Star Trek Discovery” new season sets do come out, I replace my DVD-RWs with them and use them again just in case for next year. What was the last classic TV title that Fox released? I can't remember most of us have a classic tv title wish list from fox from 12 years ago with no titles crossed off. 12 o'clock high for example. Exactly. That Anchor Bay Deal was very, very rare. I'm almost certain Disney will never license out anything ever again. That is what I fear, but you are probably right. So many layoffs. Not surprising since there are a lot of redundancies between the two companies. Disney announced they are closing Fox 2000 studio after its in progress films are completed and released. Some of the films released by Fox 2000 were Hidden Figures, The Fault In Our Stars, The Devil Wears Prada, Marley & Me, Love, Simon and The Hate U Give per the article linked below. Disney has always been awful about releasing TV series to home video. If you didn't snag Zorro in the five minutes it was available, you missed out. I am still stinging about Dr. Syn, Alias the Scarecrow. I don't expect this to change. Earth*Star Voyager is long forgotten. I did catch a streaming copy of a bootleg and it aged very poorly so maybe that's not the worst thing ever. Even their feature The Black Hole is only on old Standard def DVD, as far as I know. Nah, this isn't good news for Fox library releases and classic TV Series. Even their feature The Black Hole is only on old Standard def DVD, as far as I know. It's available in HD Digital to rent or buy on Amazon (not sure if it's at iTunes or others). Coolio! But it's not on physical media, is it? I'd snap it up in a second. Not blu-ray, that I could find. I looked thru Amazon US and UK; seems to be DVD only. My thoughts exactly BobO'Link- Fox & Disney are the 2 worst studios as far as DVD releases go and now thanks to this merger they will become 1. <_< Neither one seemed to care about their library of TV shows, they both pretty much released only the most popular (i.e. best selling) series from their libraries, leaving the rest to gather dust in the vaults. Fox did license out some stuff to Shout! but Disney seems to only care about their animated movies which they release over and over in many different incarnations- how many times can you release the same thing?? Neither one seemed to care about their library of TV shows, they both pretty much released only the most popular (i.e. best selling) series from their libraries, leaving the rest to gather dust in the vaults. Said "most popular" (a.k.a. best selling) series being anything and everything of today, and hardly anything classic! The companies have successfully put the genie back in the bottle by clawing the concept of ownership back from the people and convincing them that a glorified rental scheme is the way to go. I don’t think it’s that simple or cut and dry. Streaming would not have taken off if people weren’t interested. Streaming came to popularity around the same time that Blu-Ray exited its “early adopter” phase. Consumers had the choice at that time if their next phase in home media watching was going to be upgrading to a new disc player and buying new discs in a new format, and/or streaming. The majority chose streaming as the natural evolution of how to watch stuff at home. The vast majority of home viewers don’t want to own everything they want to see, and don’t want to revisit everything they’ve ever seen on a regular basis. Most people don’t want to make a lifetime commitment to a film or show. We’re enthusiasts here and we do want such things. But the general public never has. Physical media sales aren’t down because the big bad studios are tricking poor confused uninformed customers into an evil streaming program that robs them of their free will. Physical media sales are down because most customers aren’t interested in purchasing a physical object and retaining it forever, especially when they can simply press a button, watch something, and move on. Most people don’t want to make a lifetime commitment to a film or show. What is it about streaming that the general public thinks is better than discs? It’s quick, it’s easy, it’s not messy, it’s reasonably inexpensive. If you have a device that can access a storefront like Vudu or iTunes, you can rent pretty much every movie that’s in print in the US – and many that aren’t on disc, or that are DVD-only – usually for less than $5 a title. There’s no late fees, there’s no going to a store to pick it up and return it, there’s no chance of something being out of stock. You press the button, you watch the thing. Turns out most people aren’t even that specific about what they want to watch. For only about $10 a month (or free if you already have Amazon Prime for shipping), you can get a service like Netflix or Prime and watch a vast rotating selection of films and shows dirt cheap and since the selection is always changing, you’ll never run out of stuff to see. I think a lot of average consumers dipped their toe in the waters of collecting when DVD was at its height, and discovered that there just wasn’t much value for them in having the discs. Those discs took up space, cost money, and most people realized that they didn’t rewatch them a ton, if they ever watched them at all. And those who bought DVD noticed that Hollywood then wanted them to buy it again and again and again between special editions and new bonus features and new formats. The idea of rebuying something every few years doesn’t hold a lot of appeal for most people. This next bit is purely anecdotal, but everyone I know has moved away from discs, even those who upgraded to Blu-ray when it came out. I’m the last man standing here. People still ask me about movies, but they don’t ask to borrow my disc, they ask if something is worth seeing, and if I say yes, they stream it. Everyone I know is watching more TV than ever before, but they’re not watching from disc-based media. Even I’m getting rid of some discs, and I love collecting physical media. But I have some discs that I’ve owned for 5, 10, 20 years that I’ve never watched, or watched once and disliked, or that are so obsolete in terms of technical quality that they’re no longer enjoyable to watch. I think it’s an indication of how little demand there is for physical media that most of the titles I’ve tried to sell on HTF, which include many limited editions and out of print titles listed far below cost, in excellent condition, at a place filled with people who love collecting physical media, most haven’t sold or attracted any interest. Simply put: if you guys aren’t interested in out of print Twilight Time discs and rare 3D titles and Criterion discs, how much less does the general public care? How much did the great-recession of the late-2000s contribute (or compounded) to this dilemna? Speaking for myself, I was very reluctant to waste cash on stuff like cds, dvds, etc …. during the late-2000s. During the lowest depths of the recession, the few cds/dvds I purchased were mostly thrift shop finds for $1 or $2 a pop. I was in no mood to pay $15+ for a music cd or dvd. For that matter nor hd-dvd/bluray, without ever jumping onto one of the bandwagons. I think a lot of average consumers dipped their toe in the waters of collecting when DVD was at its height, and discovered that there just wasn’t much value for them in having the discs. Those discs took up space, cost money, and most people realized that they didn’t rewatch them a ton, if they ever watched them at all. I'd actually challenge this just a little. I think most average people saw value in upgrading because the difference from VHS was so huge, and there was probably a sense that, like music, movies were moving from tape to disc. What else could be beyond that? Collections might have been bigger because more was available, especially with TV series, but based on personal experience I've never gotten the impression most average folks considered their discs more or less collectible than their tapes. And they certainly took some space, but less than VHS. More than anything I think average people just didn't need to own, period. They did because there was nothing else. What's different now is there is an incredibly attractive alternative in the eyes of many, so much so that folks like us are the last ones standing for our various reasons. There's little doubt everyone would have stuck with discs, mostly DVDs, if streaming hadn't come along. Honestly, I think this would have happened regardless of recession. If you give people the choice between spending $10 to have a disc with ten songs on it (and no choice over which songs those are), vs $10 a month to listen to every song ever, most people will pick the latter. It’s just a better value proposition for most people. It makes sense. People a little older than me were asked to buy their favorite music over and over again, on vinyl, 8-track, cassette and CD. That’s a lot of times purchasing the same thing. Then Pandora and Spotify and Apple Music come along and say, don’t worry about formats, don’t worry about future proofing, don’t worry about buying things again and again, just pay us a small fee each month, a fee less than a single album would cost, and you’ll always have music at the touch of a button. That’s a value proposition that fulfills most people’s needs. It doesn’t surprise me that the same pitch is working for movies and TV shows. I agree. The recession might have given the impression of hastening it but only because disc sales plummeted, which had little (but perhaps some) to do with streaming. The tech was still coming regardless. My biggest fear is that the dawn of Disney’s new streaming service will be the de facto end for blu-ray/DVD releases for the Disney/Fox titles. This is it in a nutshell. Both were individually terrible, and now they'll be collectively terrible. I still think it was a huge tactical mistake to have four disc formats out there at the same time: DVD, Blu-Ray, Blu-Ray 3D, and UHD. In addition to being confusing to consumers, it's meant that the sales volume for any one format is going to limited. Blu-Ray 3D is effectively dead in the North American market, but that still leaves three formats. If the studios had been smart, they would have ended standalone DVD releases shortly after Blu-Ray won the format war, released exclusively Blu-Ray/DVD combo packs for 3-4 years as a transitional period, and then moved to Blu-Ray only releases after that. UHD will probably never move beyond a high-end niche market position, the Laserdisc to DVD/Blu-Ray's VHS. Something I didn't mention earlier is both studios seem incredibly ignorant of anything that was produced before ~20 years ago *unless* it's one of their "cash cow" type titles. With Disney starting to let go the Fox staff, and likely the few who actually know what titles Fox owns, I'd suspect the output from Fox will degenerate to *only* those "cash cow" titles. I can't see anyone from Disney saying "Well… we need to get research done into titles Fox owns that we might be able to update or release and make back some of that money we spent to acquire the properties." I couldn't agree more. By not automatically making *every* BR release a "combo pack" the BR consortium effectively killed the format from the start. They also overpriced the format, like is done with every new format, and effectively discouraged purchasing BR over DVD. Most people took a stance of "Well that DVD is $10 but they want $25 for the BR. I'll buy the DVD. It's good enough and cheaper." I own BR equipment, mostly purchase BR, and *still* look at many titles that way. At least these days the BR is often less expensive than the DVD and many times a combo pack to boot. 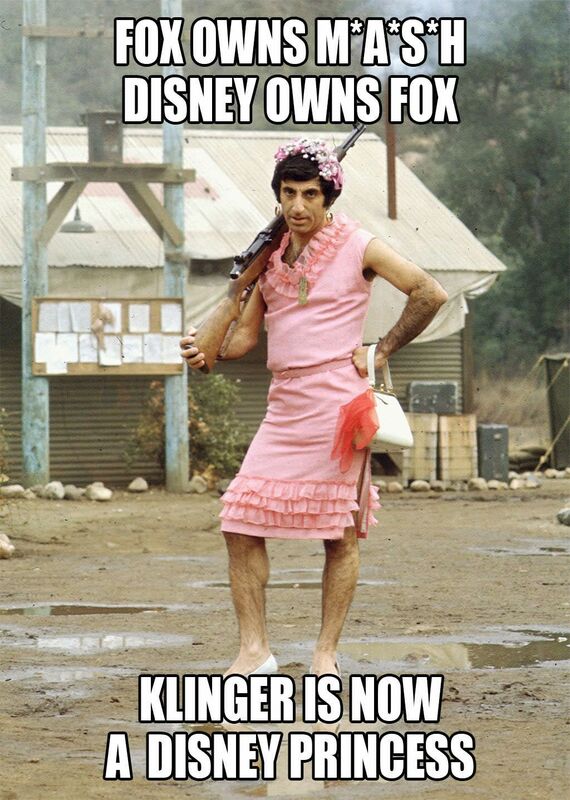 Funny, but unfortunately M*A*S*H is probably the one out of the these two that Disney could/would do anything with. Rocky Horror would be licensed out elsewhere, but Disney would still earn a profit off of it though sales. Disney also has now The Big Valley, The Many Loves of Dobie Gillis, The Loner, The Monroe's, and Daniel Boone starring Fess Parker who was Davy Crockett for Disney a few years earlier. My only disagreement about Physical Mediia Vs.Streaming is……over time…..streaming is going to eventually go the same route as cable. Prices are going to go up….they are going to find ways to up the prices (infamous "new technology fees" for example). Plus how many streaming services are you going to subscribe to (Netflix, Hulu, HBO-Go, CBS, Amazon, etc….)? Pretty soon you will have as many subscriptions as a comcast cable bill. Plus the fact, that if you purchased a movie / t.v. show on "the cloud", and the way entertainment companies merge with one another (example Disney/Fox), the show you purchase on one streaming service might go away, cause the show that the studio is on will no longer be associated with streaming service you are subscribed to or go away entirely. Don't get me wrong……I am not against streaming by any means……but if I want to watch a rerun of "I Love Lucy", "The Honeymooners", "The Sopranos" or "Breaking Bad" (as examples)…..I just pull out the DVD or Blu Ray (from my already invested collection) and pop it into my Blu-ray player (that plays Blu-ray, DVDs and even CDs) and watch it for free or without it disappearing on a "cloud". I do realize Blu-ray players (they can last about 7+ years….I still have my very first DVD recorder that I purchased in the late 90's…..and it still works!!! ….Panasonic btw), but they can crap out and Discs can get damaged, but you have to take care of them to last. My investment in physical media, at least for me, out ways streaming imo. Again, I'm not trying to say streaming is worse than physical media. Streaming serves it's purpose, especially for the general public. I just think much of the general public don't educate themselves on how electronics work sometimes. I don't think they realized that when they bought a Blu-ray player, that most of them could also still play DVD's and CD's. Some of my family members and friends, didn't realize Blu-ray players could do this until I mentioned it to them. And then I had a coworker who I burned a DVD for her, put it in her car to play. She said, the disc won't work in my car…..I said, what kind of player do you have? It turned out it was a CD player…..in which a DVD or Blu-Ray won't play. Plus she thought the disc I gave her was a CD (even though I had labeled it "DVD") The General public I think just got confused and didn't realize that with each new upgraded format, their upgraded player would still play the older formats (most players). But "older" format players would not work for the upgraded format. So I do understand, why the general public would go for streaming. But there too….the general public might not realize now…..but later…. about the subscription pricing structure of streaming down the line (much like the way cable did) and the eventual cost to the many streaming services they describe to. I think for most people who are on this Blu-ray/DVD/TV On DVD/Blu-ray forums are more opted to stick to physical media than streaming because they appreciate the formats and understand how they work more (Film/TV Show enthusiasts vs. General public). However, "Convenience" I think out ways either physical media or streaming, depending which side of the fence your on. My only disagreement about Physical Mediia Vs.Streaming is……over time…..streaming is going to eventually go the same route as cable. Prices are going to go up….they are going to find ways to up the prices (infamous "new technology fees" for example). Plus how many streaming services are you going to subscribe to (Netflix, Hulu, HBO-Go, CBS, Amazon, etc….)? The only time I ever use my standalone players, is if I am watching a bluray with my full attention devoted to watching it. If I a not willing to devote my full attention to watching a movie/episode, then I won't bother watching it on the standalone bluray player. Otherwise I just rip my dvds to the computer, and have the episodes/movies playing on the computer in the background when I'm at home. That’s what cable news channels are for. There are two in our area which we keep as a sort of “screen saver”. I keep the kitchen TV tuned to one of them as I unload the dishwasher etc. If we watch a new to us movie, we do give it our full attention, of course with the 20 minute rule. If it has not grabbed us by then, off it goes. When we watch regular tv, my wife’s iPad is her constant companion. She games, and my duty (since the 1980s and our first Betamax) is to zip through all commercials. We almost never watch anything “live”. We even record and watch our local news starting 20 minutes in so we can ff through the “boring” parts. Our friend who is technophobic told us at a recent lunch that she had to leave soon to get home to “watch her story”. We wondered if she was time travelling to the 1950s! Back in the day I use to do this with CNN playing in the background. Nowadays 24 hours news channels are just "too exciting" to watch daily. Almost like watching the "superbowl" every day. When my TV was still connected to cable I used TLC, History Channel, and Food Network for that as I absolutely detest broadcast news. I worked for a broadcaster directing 2-4 newscasts per day for 21 years. Over that time I grew to dislike "news" almost as much as sports. We get Canadian news and channels but also those from the USA, so anytime I get bored with the US scandals, I can switch over to the Canadian scandals until those too become boring. Canadian "scandals" are mind-numbingly boring, especially compared to the American stuff these days. Someone on our local radio station remarked that the American news people would say, “Aw! look at the cute scandals the Canadians have”! Disney is removing all their content and Fox’s content from all platforms and moving it exclusively to a streaming service. This is the reason for the merger — to acquire the library. I'm really looking forward to signing up for D+. Sounds like it will be a treasure trove of movies and shows. The Disney buyout has fast tracked my decision to purchase some Fox TV shows on disc I have been on the fence about. I'm certain Disney will never/ever re-release or license them out. It is now or never. Strike first, and strike hard. Last night's episode of Family Guy was titled "You Can't Handle the Booth" and the premise was that the Family Guy cast goes into a booth to do audio commentary on an episode of Family Guy. It gets very surreal in the second half when the voice actors tell the cast they aren't real. LOIS: "This is bullcrap, I'm calling Fox or Disney Payroll right now." OPERATOR: "Fox or Disney payroll." LOIS: "Yeah, this is Lois Griff… "
Are there plans to release Good Morning Miss Bliss separately? Right now it's only part of Shout's "Complete Collection" set. Buffy, Angel, X-Files, The Big Valley just to name a few. I know there are more.